We’re pleased to announce the arrival of a new senior cow in to the herd with a view to starting a new cow family as we have recently purchased Hockenhull Girlie 27th from Michael Hind. This family needs no introduction as Girlie’s have had considerable success in many herds. Girlie 27th is by Blackford Harvester and out of Girlie 8th. 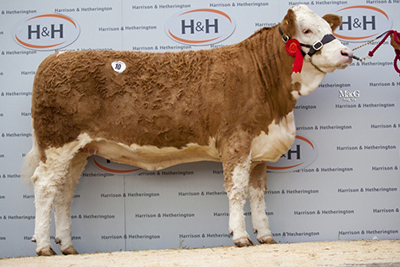 Our jointly owned stock bull Skerrington Vanguard has had a good summer show season by kicking off proceedings at the Heathfield Show by taking the male interbreed championship. This July 2007-born Corskie Proton son out of the Dovefields Gallant daughter Skerrington Sunrise 16th and is owned in partnership with Broad Reed Farm Partnership. He also went to the South of England Show where under judge James Arnold, he won the senior bull class and secured the male championship, before heading to Norfolk for the English National Show where he stood fourth in a strong class of senior bulls. Two young bulls represented the Boars Head winter show team at the East of England Smithfield Festival in December, held at the Peterborough Showground and in strong classes, Boars Head Daredevil took the reserve championship. Born October 2012, Daredevil is by Sacombe Balmoral and is out of Hockenhull Trudy 36th, who was purchased privately from Ann and Tony Jukes’ Swallowhill herd, having been bought by them at the Hockenhull dispersal sale for 11,000gns. Daredevil will be forward for sale at the February bull sales in Stirling. Then standing third in his class was Boars Head Dallas, another strong son of the successful past herd sire Seaview Prince Charming and out of Oakhill Nelly 21, a Starline Klassik daughter. This one will also be for sale in Stirling alongside Daredevil. The 2013 herd competition saw Boars Head take a second place in the medium herd’s section, as well as win the Mike Jones Memorial cup for the best family group with the Karina family. It was a pleasure taking Gerald round the herd in the summer and we look forward to hosting next year’s judge. Having been impressed with her on a recent visit to the farm, we’re pleased to announce the private sale of Boars Head Karina 2nd to Gerald and Morag Smith of the Drumsleed herd, Kincardineshire. Karina is a dark red November 2011-born heifer by previous herd sire Seaview Prince Charming and is out of the Camus Brandy daughter Swallowhill Karina. We wish the Smith family all the best with her and look forward to hearing how she breeds. Having won a first prize in the second class of Simmental heifers at Stirling under judge Iain Green of the Corskie herd, the April 2011-born Boars Head Grace 7th then went on to sell for the joint second highest price of the day at 5000gns. By our past senior herd sire Seaview Prince Charming, she is out of the Sway Harvest daughter Wistow Grace 40th and sold to James Hollingsworth for his Midhope herd. This year’s herd competition for the South East Simmental Group saw the Boars Head herd named best medium herd for the first time, as we had previously been in the small herd section. Judged by James Arnold, he was impressed with our females and the consistency of Prince Charming progeny. The journey up to Carlisle to support the first ever Leading Ladies Simmental Sale was certainly made worthwhile as our January 2011-born yearling heifer Boars Head Meierisli 5th won her class and then went on take the overall championship before selling for 5600gns to Charolais breeder John Gough, Newport, Shropshire, who bought her as a first foundation female for his new herd. She is by the prolific Seaveiw Prince Charming, a bull that has certainly left his mark in both the Kilbride and Boars Head herds and is out of the Balmano Hitman daughter Oakhill Meierisli 13th daughter. We’d like to wish her new purchaser the very best of luck and look forward to seeing how she performs in the future. Continuing her winning form the Heathfield Show earlier in the season, we were delighted to win the two year old class at Kent County Show under judge David Mills and then take the overall breed champion with Boars Head Heidi. Born January 2010, Heidi is by Beeches Nashville and is out of Oakhill Nelly 2nd, an Oakhill Moka daughter. Also in the team was Boars Head Meierisli 5th, a January 2011-born Seaview Prince Charming daughter out of Oakhill Meierisli 13th who stood first in her class and also Boars Head Nelly 2nd, a September 2010-born Seaveiw Prince Charming daughter out of the Starline Klassik daughter Oakhill Nelly 21st who stood fourth. Boars Head females had yet another successful show, this time taking two third prizes at the Royal Norfolk Show under judge John Moore of the Omorga herd, Northern Ireland. Our first third prize went to the yearling heifer Boars Head Meierisli 5th, who is a Seaview Prince Charming daughter out of the Balmano Hitman daughter Oakhill Meierisli 13. Then standing third in the two year old class was the Beeches Nashville-sired daughter Boars Head Heidi. Next stop for us will be the East of England Show, Peterborough, where the English Simmental National Show will be held.